For the most part, we really don’t know. The symbols on pysanky, and on other Ukrainian folk arts, have been handed down to us from generation to generation, and many were first created back in early Ukrainian prehistory. 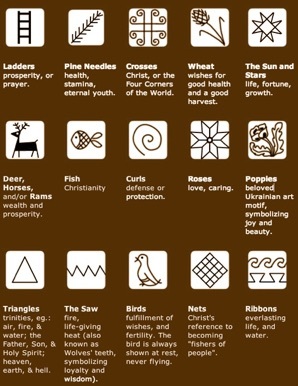 Over time, as religions and beliefs have come and gone, symbols have changed their names and their meanings. And in modern times, with the suppression of all the old beliefs, much has simply been forgotten. And this is one of the more reasonable examples. 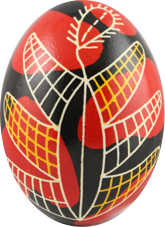 Quite frankly, when used outside of traditional folk pysanky, the symbols do not really have any meaning–they are mere decorative elements. 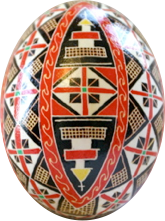 The creator of the modern ”pysanka” can assign the symbols any meanings she wants, and be technically correct. 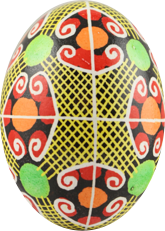 That being said, a great variety of decorative motifs are found on traditional pysanky. Some of them have truly ancient roots, originating in the Neolithic era (Trypillian culture) or even Paleolithic times. Most are probably a bit more recent, but still predate the introduction of Christianity to Ukraine in the 10th century. These traditional Ukrainian symbols can be found throughout Ukrainian decorative folk art–on embroideries, ceramics, paper cutwork, weavings, wall paintings, carved wood, metalwork–and are still in use today1. Their names and meanings vary from region to region, and even from village to village. Similar motifs can have totally different interpretations in different places, and can even be called by very different names. 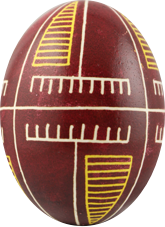 When examining a traditional pysanka and looking at its symbols, it is important to keep in mind that there is no “secret decoder ring” to discover its meaning. One does not pick out the symbols and assign each a single, simple meaning. It is not a rebus. 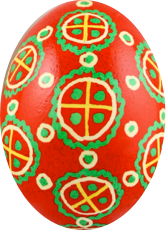 Instead, you must consider the organic whole of the decorated egg, consider its traditional name, and compare it to similar traditional pysanky. NOTE: This section is being rewritten to improve its accuracy and add more relevant photos. You can read a short summary of the subject here, a handout I wrote for our exhibit at the Detroit Historical Museum in 2013. 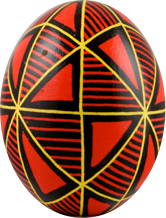 Geometric Motifs: Among the most popular (and most ancient) pysanka motifs are simple geometric figures. The egg itself is most often divided by straight lines into squares, triangles and other shapes. These shapes are then filled with other forms and designs. Common geometric symbols include triangles, rhombuses, curls, spirals, tripods, dots, and hearts. Scevomorphic Motifs: The second-largest group of designs, they are representations of man-made objects. Agricultural symbols are very common, as Ukraine was a highly agricultural society, and drew many of its positive images from field and farm. Common symbols include the ladder, sieve, rake, comb, window, windmill and saw. Phytomorphic Motifs: The most common designs are those associated with plants and their parts (flowers, leaves and fruit). 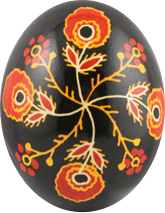 Women who wrote pysanky drew their inspiration from the world of nature, depicting flowers, trees, fruits, leaves and whole plants in the highly stylized fashion. Such ornaments probably symbolized the rebirth of nature after winter, and some pysanky with plant motifs were thought to guarantee of a good harvest. 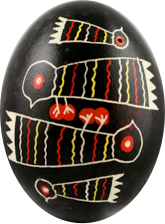 Zoomorphic Motifs: Although animal motifs are not as common as plant motifs, they are nevertheless found on pysanky, especially those from the Carpathian Mountains. Deer, rams, horses, birds, fish, insects and snakes are depicted, usually in the abstract mode. Christian Religious Motifs: With the official adoption of Christianity as the state religion in 988, new symbols appeared, and the old symbols were reworked to fit with the new religion. 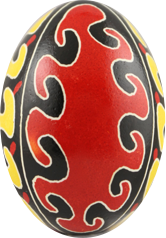 Both sets of symbols can still be found on traditional pysanky, as well as the more modern ones. Cosmomorphic Symbols: Pysanky often have on them symbols of heavenly objects, including the sun, the moon and the stars. Eternity Bands: Eternity bands are among the oldest and most common motifs on pysanky. The “bexkonechnyk” or "meander" is a line that has no beginning and no end; it is a water symbol, and also symbolizes infinity and immortality. The Symbolism of Color: The different colors and different combinations of colors on pysanky have their own meanings as well. 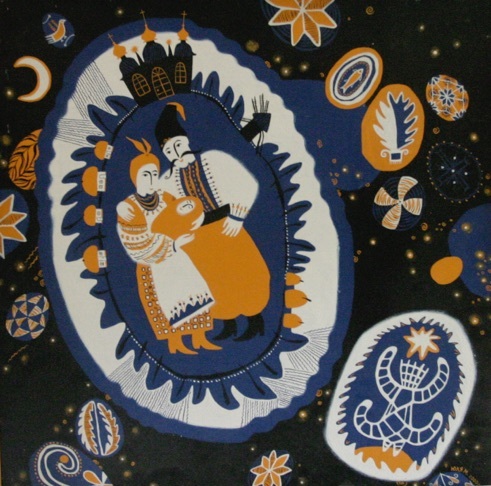 1.Selivachov’s work is a good source for understanding Ukrainian folk motifs. He compares similar motifs across different media, and demonstrates the similarities and differences between them. The more different media (pysanky, embroidery, etc.) a motif is found in, the longer it has probably been around.